At Syngenta, we believe farmers can produce enough to meet the world’s growing demand for food, feed, fiber and fuel while safeguarding the environment for future generations. We are working on a series of sustainability initiatives with a primary goal of raising awareness of the practices and developing workable solutions to produce more food. Our collaborative approach unites the value chain including consumer brands, processors, growers, input suppliers and manufacturers. 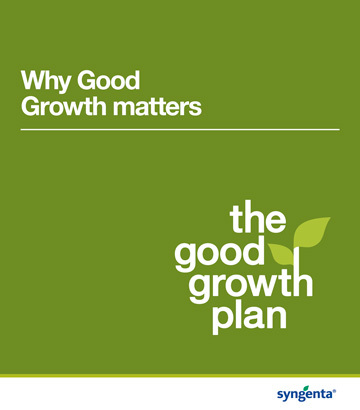 This approach delivers a holistic solution to growers by setting them up for long-term success in their sustainable agriculture continuous improvement journey. Contact us to learn more about the sustainability initiatives. AgriEdge Excelsior® is a whole-farm management program that helps Syngenta customers maximize and sustain their return on investment. Growers can collect and analyze data on a per-field basis within Land.db®, the secure, cloud-based management software to help them better understand the impact of their farming choices, make more sustainable decisions and maximize efficiency. Growers can track and measure stewardship and conservation practices like nutrient management plans, soil health practice, resistance management plans, buffer zones and environmental efficiency indicators. 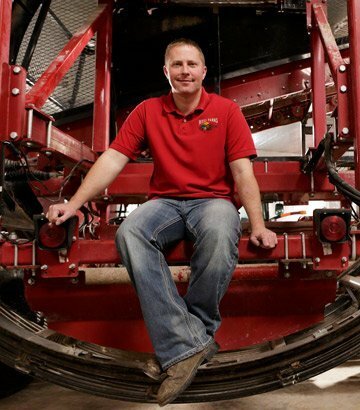 Backed by a data confidentiality pledge and a more than 90% grower retention rate, there's reason to believe in the proven AgriEdge Excelsior Program platform. 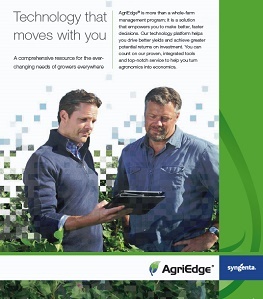 Learn how this and the other components of AgriEdge Excelsior empower growers. The Sustainable Solutions initiatives and their positive impact on both farming and nonfarming communities support these six commitments. "Sustainability has always been important because if you’re not sustainable, you’re not profitable. The AgriEdge Excelsior program has made it a lot easier for us to keep track of our inputs, like fertilizer, and calculate our land and water usage. Its ease and simplicity has meant quite a bit." 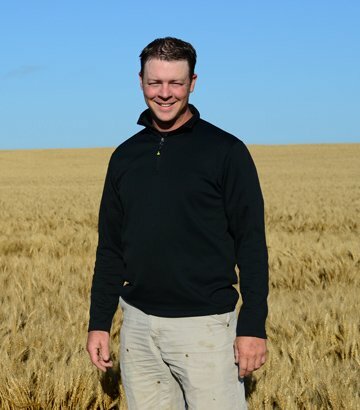 "From a sustainability standpoint, the AgriEdge Excelsior program has really changed the picture for us as far as how we’re doing on our farm. It helps us identify our strengths and weaknesses on an energy consumption basis and recognize our more profitable areas. 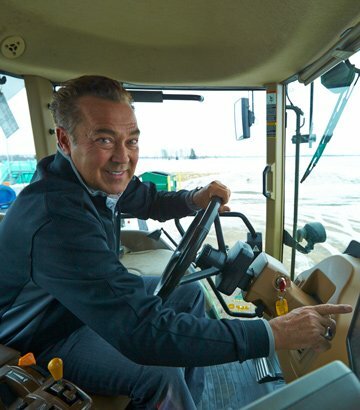 On the regulatory side of sustainability, I believe there will major benefits from being able to show customers that we are working toward a more efficient, sustainable type of operation through the program." "The biggest challenge in the future will be environmental. No doubt about it. That’s why it’s imperative that we have good records to show that we’re being good stewards of the soil. It helps us be held accountable. It’s going to start with the person who produced it, all the way to the final customer. There’s going to be a trail, and you’re going to be held accountable." Syngenta Sustainable Solutions recognizes there are many different needs for measuring on-farm sustainability for the value chain. We work with our collaborators to identify the best methodologies to achieve their specific needs. Syngenta is a member of Field to Market®: The Alliance for Sustainable Agriculture. This diverse coalition is working to create opportunities across the agricultural supply chain for continuous improvements in productivity, environmental quality and human well-being. The Alliance provides collaborative leadership that is engaged in industry-wide dialogue, grounded in science, focused on outcomes and open to the full range of technology choices. 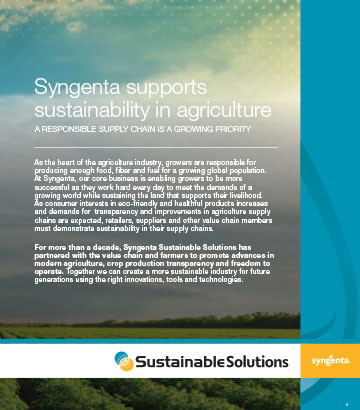 As a member, Syngenta supports solutions for sustainability and continuous improvement in U.S. commodity agriculture. Syngenta is a founding member of The Sustainability Consortium (TSC®). This global nonprofit organization is dedicated to transforming the consumer goods industry by improving the sustainability of consumer products. TSC offers a portfolio of tools and services to help drive effective implementation focused on supply chain across the entire product lifecycle. TSC represents 100+ of the world’s leading corporations and organizations working together to creative precompetitive, cross-sector solutions. As a founding member, Syngenta has the opportunity to collaboratively learn about the issues and opportunities in consumer product sustainability, network with industry sustainability leaders and ultimately improve corporate social responsibility. Still have questions? Contact us now.